Long grain parboiled rice enriched with ferric orthophosphate (iron), niacin, thiamine mononitrate, and folic acid, dehydrated vegetables (onion, bell pepper, garlic, tomatoes), salt, maltodextrin, sugar, dextrose, chicken fat, chicken meat powder, yellow #5 lakes, autolyzed yeast, disodium guanylate and inosinate, ground tumeric, silicon dioxide (for anticaking) and saffron. 1. In sauce pan bring 2 cups water to a boil. 2. Add 1 Tbsp. butter or margarine and 1 cup Dixie Lily Yellow Rice. Makes about 4-1/2 servings. For a delicious variation, use chicken broth instead of water. To retain vitamins do not rinse before or drain after cooking. Thank you so much for contacting us. Where are you in Florida? Hopefully we will have a local grocery store that will carry it. If you can’t find it in one of your local stores you can always buy it online at https://southerntraditionalfoods.com/. If you want to buy in bulk (6 jugs at a time) you can also buy it on Amazon. We hope this helps and we appreciate your business. Thank you so much for contacting us. 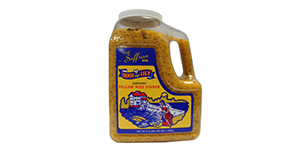 You can buy our Yellow Rice Dinner in the 3.5Lb jug on Amazon or at https://southerntraditionalfoods.com/. Unfortunately we do not have any grocery stores in your area that would carry our product. We appreciate your business and we hope this helps. 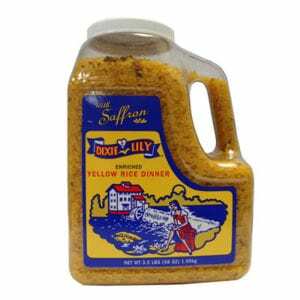 Is the yellow rice dinner in a jug gluten free? Thank you for contacting us. Yes our jug rice is gluten free. We appreciate your business and hope this information helps. Thank you so much for contacting us. Unfortunately, we do not have any grocery distribution in Texas. However, you can always order it online at https://southerntraditionalfoods.com/. We appreciate your business and we hope this information helps.